Before shooting, soldier described suspect as "nice guy" with "major issues"
(CNN) -- The mother of one of the American service members killed in a military stress clinic shooting in Baghdad said Wednesday she harbors "mixed emotions" toward the attacker who killed her son. Pfc. Michael E. Yates Jr. was one of five service members shot to death at a stress clinic in Baghdad, Iraq. 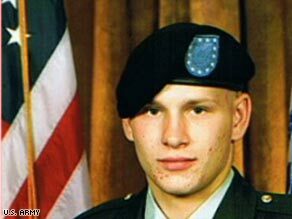 "I feel for him, but at the same time I am very angry at him," said Shawna Machlinski, mother of slain 19-year-old Pfc. Michael E. Yates Jr.
Sgt. John M. Russell has been charged with five counts of murder in the killing. Yates of Federalsburg, Maryland, was one of the five service members slain Monday. "I think he [Russell] needed help and couldn't get it fast enough because you have to wait on everything with the Army," said Machlinski, referring to the alleged shooter and the problems the stress clinic addresses. She and Yates' stepfather, Richard Van Blargan Jr., spoke with reporters Wednesday in Maryland. "As much as I have a lot of anger towards him, I also have some sympathy because I know he must have been going through a lot, as well," Machlinski said of Russell. While she said that "doesn't excuse" the shooter's actions, "I believe that if he would've gotten the help that he was there to get, maybe sooner, or got more help and other people recognized the signs, because there are signs, and you don't have to be a rocket scientist to figure those signs out." "We're not sure as to what happened over there," Van Blargan said. Speaking about Yates, he said, "We do know that he was at the stress clinic. Like quite a few other military people, they've all dealt with the stress the best way they could. He was due to go back to his unit today, until this unfortunate event." Van Blargan said he didn't know much about the shooting suspect. "He was probably under a lot of stress as well. Quite a bit more from my understanding," Van Blargan said of the shooting suspect. "He has friends and family, extended families that will miss him dearly." Van Blargan said Yates told Machlinski in a phone call on Mother's Day that Yates had met the suspected shooter, saying he was a "very nice guy" and "could deal with him" but that the man had "some major issues." "He was out there on the branch hoping for somebody to help him," Van Blargan said. Van Blargan said Yates -- who was a father himself -- is going to be missed. "He was a good man, a good father. He took care of his responsibilities. He was very honorable. He was a good son. He treated everyone with respect and he just wanted respect back," Van Blargan said. Machlinski said her son told her in the Mother's Day phone call that the clinic program he attended "was kind of stupid because he had to color and do arts and crafts and cut and paste." But Machlinski said her son knew he had to complete the program so he could go back to his base. "He was one of the lucky ones that understood that he needed help," Van Blargan said.